Our bullet train pulled into this remote town after dark and after a thirty minute bus trip across town, we checked in and headed straight to bed. We assembled in our finest waterproof hiking gear just before 8am, full of energy, awaiting a full 9hr day of hiking one of the many routes in this spectacular nation park of gorges, rivers and mountains. We travelled in a steamed up local bus to the Reserve, aware that soon we’d be outside in what was a cold and persistent drizzle. The initial entrance was impressive, crossing wooden bridges across the turquoise green river being navigated by tourists on bamboo rafts. 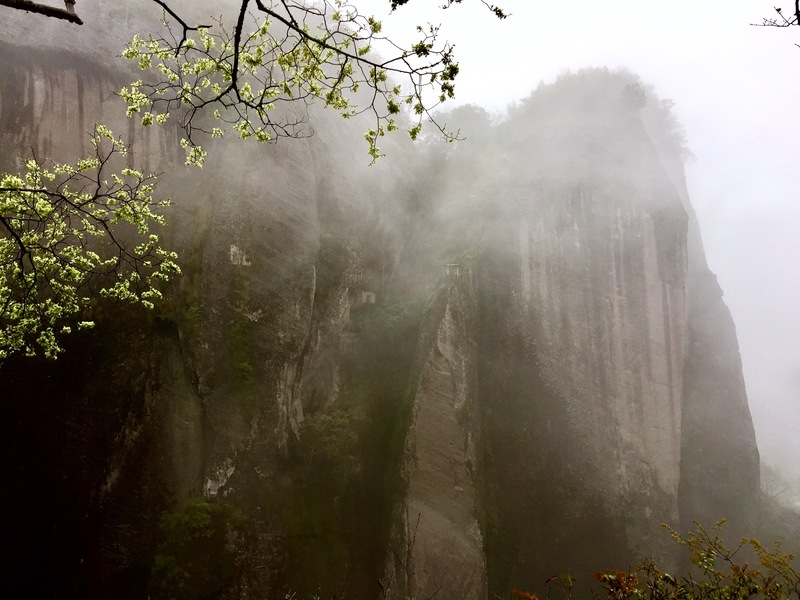 We soon began to ascend the 848 steps to the top of the most famous peak – looking up, the peaks looked like something out of the film Avatar, shrouded in a heavy mist and rain. 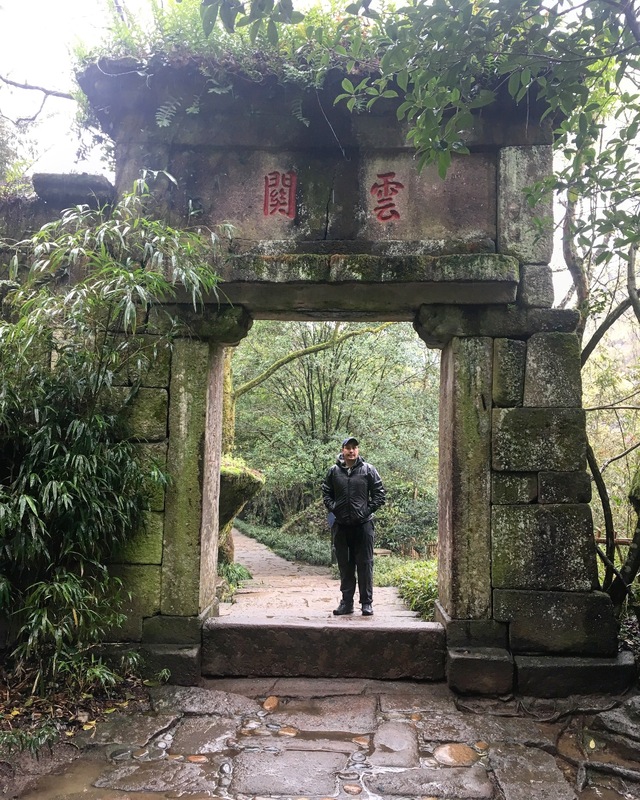 The paths winded their way up the giant rock faces, packed with hundreds of mainly elderly Chinese escaping the city for fresh air and exercise. The rain made stopping for photos tough – everytime your phone left your pocket things got wet and cold. Chinese people also have no concept of queuing, personal space or politeness and so the climb became a wacky races exercise in being over taken, undertaken and barged out of the way by sprightly OAPs on the tightest almost sheer vertical sections. The photos online looked spectacular and we’d hoped to get some flight time with the drone along the river and up the mountain. But alas the morning showers turned into a deluge and showed no signs of clearing up – after threes hours of hiking in the rain we’d gone from damp to soaked to the bone in temperatures in single figures. Our waterproof jackets failed the monsoon test – nothing was dry and we had to fashion backpack covers from the plastic bag carrying our lunch. With the rain becoming intensely cutting we made the decision to abandon the hike at lunchtime – even the final sprint back to get the Reserve gates and bus into town were somewhat traumatic as the cold took hold. With a shortage of things to do in a town famed for its outdoor activities we took the opportunity for an afternoon nap, followed by dinner at a local restaurant consisting of all our favourites dishes; broccoli with garlic, sweet and sour pork, steamed rice, bamboo shoots, beef in a black bean sauce, potato slices and green beans. We’d hope to celebrate St Patrick’s Day with a few drinks at a bar – but Wiyushan is literally a town that exists just to serve the nature reserve. While restaurants served beers our best bet was to invest in some local Chinese wine, beers, brandy and snacks and have an improvised party at the hotel. With everyone else’s rooms looking like bomb sites – we gave in to the sorry faces and offered to host what turned into six hours of drinking games. By the time everyone had headed to bed at 3am the room smelt like a brewery with beer and wine soaking the floor and duvets – oops! We had planned to wake at 8am to check on the weather and decide on a return visit to the park – in truth if the heavy drizzle hadn’t made up our minds the thumping hangover sealed the deal and we snuck an extra four hours sleep before a frenetic clean and pack. Feeling a little tender we ventured down to check out and get some lunch – the lift doors opened to reveal two hundred or so ageing Chinese had invaded our hotel lobby and in typical fashion we’re all shouting at each other from inches away, smoke and making horrid hacking screeches as they prepared to spit…needless to say we needed to get out of their fast. While a couple of guys headed for a KFC, we grabbed some lunch at the same restaurant we ate at the previous evening before getting a bus the forty minutes to the ‘small train station’. Like most infrastructure in China, small means passenger numbers and not the vast modern airport style terminal – small passenger numbers also being relevant to a population of 1.4bn. 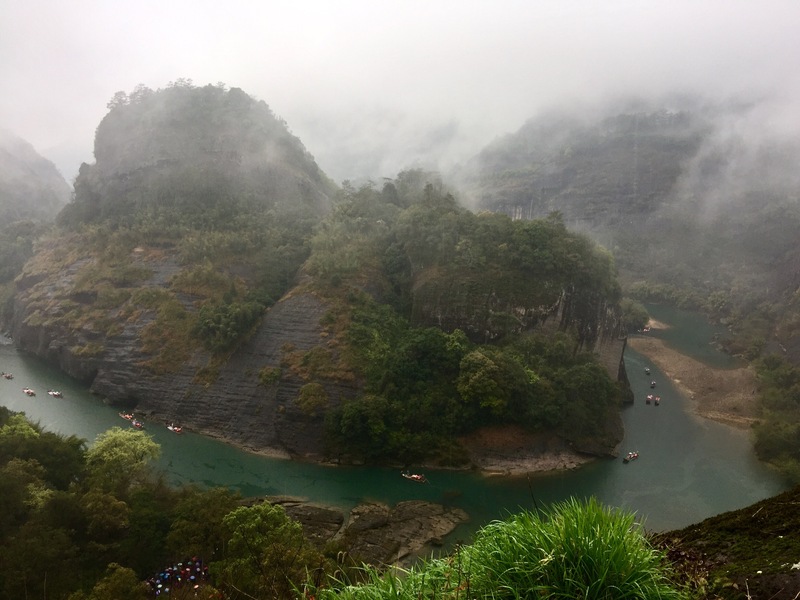 Our second bullet train was ready to roll out of Wiyushan at 3.20pm – we couldn’t help but think that the weather had put a real dampener on what could have been a stunning location. We’d missed out.